There have been so many changes since I wrote last month’s blog I hardly know where to begin. I started off this month by beginning to paint the Pentacles / Discs pip cards for the new Initiates Way Tarot and gained more understanding about my own relationship between work, finances, energy and grounding of ideas into the physical world. I don’t know if it’s an Artist thing or a projected state of mind that we have drummed into us about Art being a hobby, or something else that you do away from your real job, but I have had a fraught relationship with being an Artist for most of my adult life. A friend posted on Social Media about the need for having an identity as an Artist and what that means in terms of what people expect from you and one of the issues I have battled with for a long time is putting a fee on the work that I create. It is a job like any other and sometimes it can take a lot more effort to make money doing it than it does to go and work for someone else as an employee and take home a regular wage. Self confidence and self esteem almost certainly come into play when it comes to selling Art. Can you talk to others about about it? What makes one piece of art worth more than another, other than whether the Artist is dead or alive? During this process I plunged headlong into the shadows of the underworld and by submitting to introspection and dealing with whatever that threw up in terms of learning and life lessons, I journeyed through the creation of the remaining images and find that i’m standing once again on the high vista of the plateau of the Fool / Jester. Ready to jump into the abyss and begin anew. The images for Justice, the Hanged / Drowned Man and Death literally fell out of the ether and on to the canvas in a week after having an unbelievably stressful lead up to the release of these images. As of today there is only one of the Major Arcana left for me to paint. It is the 22nd tomorrow so I intend to focus on painting that and then the entire Major sequence for this deck will be finished. The three remaining court images for the Pentacles and Discs are on the menu after that while plotting and scheming for the festive period. There will be a Calendar available which will include all of the new Initiates Way Tarot images for anyone who would like to order one. Please Email and register your interest and I will contact you directly about the order process. The images are coming thick and fast for the new Deck. Coincidentally finished the image for the Chariot just before travelling to France for the Summer. As usual there have been lots of things happening during the stay. I have been editing the Tarot workbook and have finally finished writing all of the guided Meditations for each of the Major Arcana and have begun recording them for publication as an Audio series that will be suitable for solo development work or for groups. The biggest thing that has happened since arriving in France was my Ordination as a Priestess in the Fellowship of Isis. Just before I embark upon creating the image for Strength / Fortitude I had a vision of the Lioness who radiated the most amazing healing power that I was in complete awe. Even though it is still August I have been inspired to paint the Ace of Cups Also. It was my intention to paint the Cups Court Cards on my return but they have also begun to emerge. In between writing and painting the new images for the deck I created my gift of dedication to the Goddess Athena. I have not painted with watercolours before so it was a completely new medium to work in and has given me inspiration to try lots of different styles! There have been intense healing moments, connections with the Fae in the Forest and precious moments of baby deer skipping across my path. Magical moments that will be treasured forever and imbued into the journey of the creation of the Initiates Way Tarot. Humbled and honoured to be alive at this time and filled with inspiration for the future. 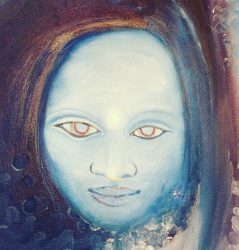 Since the first stirrings of Spring I have been immersed in painting the Court images for the new Initiates Way Tarot paintings. The first image that I painted just before the Court images appeared was the Ace of Swords, or the root source of the powers of Air. It has been an interesting journey since the turn of the tides at the Spring Equinox this year! More focus, orgnanization, cutting away the doubt and invoking the imagination into action after the long winter. The first of the Court images to manifest was the King of Swords who is the benevolent kingly ruler that you see in the image below. Each of the personality types has a completely different feel and this one definitely radiates peace and the ability to wield power efficiently, for the benefit of others and from a place of love. The second of the Courtly Sword Persona’s to manifest was the Queen of Swords. Very different from the peaceful aura of the King. She is stern, yet keenly perceptive looking at you with a gaze that pierces right through to your very essence. Next to appear after that was the Princess of Swords. The princess radiates calm and serenity. All of the Sword Court images have been finished with rustic golden eyes, painted on with metallic acrylic and the gentlest touch of the fingertip! Each image started out as a little bit of gouache paint applied to the canvas and some water and I used my fingertips to manipulate the water and paint into a ghost image of each character with the paint and water. Once I saw the lines of the face I started to paint from there adding colour and depth until the character sprung to life! The last of the Sword Characters is still underway but the Prince of Swords has most definitely taken form and as this season closes and the next begins, after completing the Lovers image I will move on to the Initiates Way version of the Chariot! If you are interested in learning to use the Tarot for Spiritual Development please get in touch as I will be running some Monthly workshops/development groups in Sept / Oct this year using the 22 Major Arcana Guided Meditations that I have written.